The Manitowoc UY-0240 AIce Machine is an air-cooled ice machine that produces up to 219 pounds of half dice size ice cubes daily. Includes an ice storage bin with 80 pounds ice storage capacity. Only 26 inches wide, 28 inches deep, and 38.5 inches high on 6 inch legs. Stainless steel finish. Forward-sliding storage bin for easy access to refrigeration components, smooth sealed food-zone with removable water trough, distribution tube, and damper door for faster cleaning. AlphaSan added to key internal components. NSF listed, ENERGY STAR qualified. Featuring universally recognizable display icons that speak a universal language. Power, Delay, Cleaning, Bin Full and Service buttons provide on-the-spot feedback. Bright, easy-to-read indicator buttons illuminated by long-life LED lights that are on a slanted bin front for simple viewing and activation. Energy efficient- saving at least 10% on energy consumption and 25% on water usage. 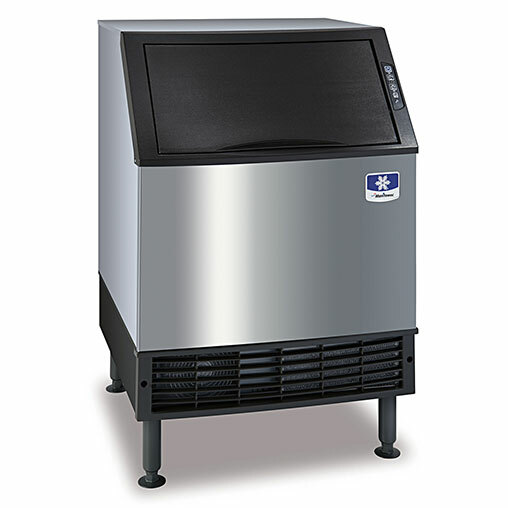 Available as both an air-cooled or water-cooled machine with various ice cube styles. See Ice Cube Style Chart for comparison of ice cube styles. Please contact our equipment experts for further assistance.